One of the greatest joys of a young child’s life can be learning to swim. While children as young as six months old can be exposed to the pool in small doses under complete adult supervision, children around the age of four can begin independent lessons where they begin their skills development, learn water safety and build their confident in and around the pool. As children either make the transition from adult participation classes or begin their independent water training, they should be no younger than 4 years old. For young children, make sure the student to instructor ratio does not exceed 5 to 1, since young children require extremely vigilant supervision and large class sizes make this more difficult. As they begin, children’s swimming lessons focus on water adjustment, especially with putting one’s face in the water. Other skills highlighted in early classes include floating, kicking, and beginning arm movements which will later be developed into stroke formation. Once children have developed a certain degree of comfort in the pool, they can begin with water exploration lessons. Most experts agree that children should be at least 5 years old before they start learning the fundamentals of swimming. Initially, children are taught to swim on their front by kicking their legs and moving their arms in a stroke known as the doggy paddle. After the initial concepts of the doggy paddle are taught, children learning how to execute side breathing, which is a fundamental skill for freestyle swimming and front stroke. In the meantime, instructors also help young swimmers with their floating by teaching them how to turn over in the water. At this point in a young swimmer’s lessons, they are introduced to the deep end of the pool. Once children have mastered these fundamentals, they move on to the finer points of each of the skills. For example, children are taught to combine the front stroke with the side breathing technique in a stroke called front crawl, which is the basis for the freestyle stroke. At this point they are also introduced to the back crawl. While the emphasis is on fun, the roots of endurance training are also introduced. In order to participate in this level of children’s swimming lessons, children are expected to be comfortable in water over their head. They are taught the crucial skill of treading water, which will be applied throughout their time in swimming lessons. Swimming lessons are not all just fun and games. Children learn important aspects of water safety that can very well save their lives or the lives of others some day. 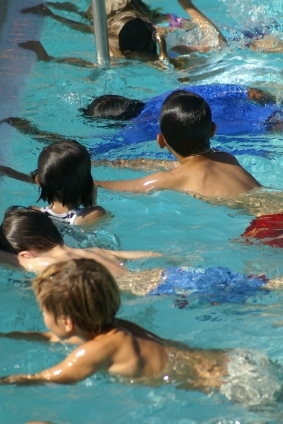 Many instructors integrate water safety tips into their lessons plans, and there are also at least one or two lessons of the class devoted entirely to water safety. Children learn such important water safety tips such as never swim alone, never run on the deck, and that a floatation device is not a sufficient stand-in for an adult or buddy. As children progress in their swimming lessons, mouth-to-mouth resuscitation and eventually CPR (cardiopulmonary resuscitation) is taught and practiced on dummies.